AdamMaleBlog - Gay Culture, Art, Music, Humor, and more! 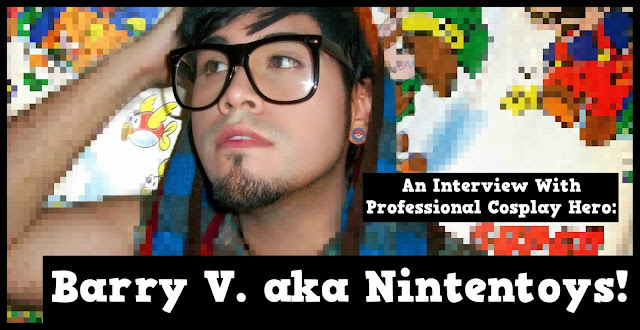 : An Interview With Professional Cosplay Hero Barry V. a.k.a. Nintentoys! An Interview With Professional Cosplay Hero Barry V. a.k.a. Nintentoys! Barry V., known in most circles as Nintentoys, has made quite a name for himself on the West Coast as being the go to guy for Nintendo and Disney themed cosplay events and costume commissions. His creations have been featured on G4, Howard Stern, the main page of Yahoo, Cosmode, Like.com, LA Fox News, Kotaku, IO9, as well as getting shout out recognition by Disney and Nintendo via twitter and the internet. From Comic Con to the Anime Expo, you will find Barry and his numerous creations being fawned over by the awestruck crowd. Also, we need to mention Barry has become something of a gay icon among the cosplay and gaymer crowd. We first noticed his dashing good looks on Instagram where he has thousands upon thousands of followers. His Instagram handle is Nintentoys, btw...go look him up. Barry credits his Mother for giving him a leg up in the business. He explains, "My mom was a theater costume designer and actress so I grew up in this world of costumes. I learned a lot from her and my sister on how to be very crafty. Also, growing up Mexican, I've learned that the Mexican culture is very colorful, vibrant and visually stimulating. They oddly have a very strong love for Disney, and most other animated characters, more so than people from other countries. 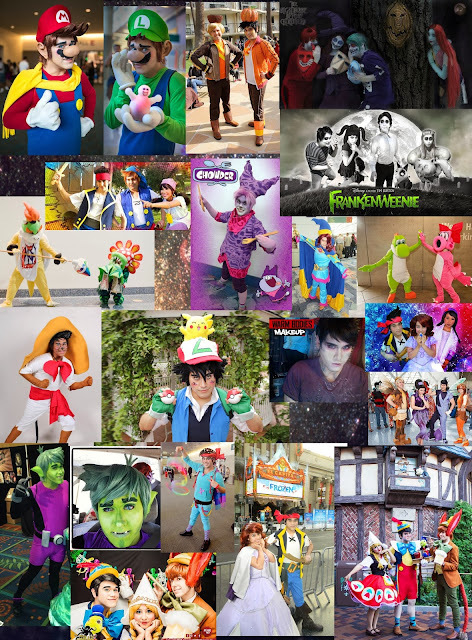 That's why most of my costumes are usually characters from Disney and Nintendo. I grew up with these characters, so I want to do justice to them by putting hard work into them." Though painfully busy with professional appearances and charity events around the Holiday Season, not to mention finishing up college for the semester, Barry made some time for us and agreed to sit down for an interview. Q: You attended your first convention in 2001. Which one was it and what costumes did you see that made you want to start making your own? Barry: Honestly, I wish I could remember what was the first convention I attended, but I have such a bad memory.What I do remember is going to conventions all the time and having fun, but I started to notice that people who were in costume were having 100 times more fun than I was having. So, that's kinda what triggered it in my head. Q: What was the first convention you attended in costume and what was the outfit?Barry: The first convention I attended in costume had to be Anime Expo. I remember I spent a lot of sleepless nights making these two mascots of Bowser Jr and Petey Pirahna from the Super Mario video game franchise. I could have just made something super simple that looked kinda like the characters and could have been content, but I started to notice once I get into that creative zone in my head, I just can't stop. I kept adding and adding and adding to the costume to the point where I feel like I'm a Macy's Thanksgiving Day Parade float. Usually that's when I realize I am done with the costume. Soon after Con Season was over, my brother in law said that my costumes were on the main page of Yahoo for the best Costumes of Comic Con. Once I saw my pictures on there, I was too proud to admit it at the time, but I loved it. I loved that I was on a website that reached so many people. I guess overall I loved the attention I was getting and the appreciation of something that I created with my own two hands. Ever since then this hobby of mine kinda took off. Q: Now that you are a veteran, what are your favorite conventions? Barry: Wow. Thank you for the compliment! I appreciate it. I don't consider myself a veteran though, well at least not yet. There is so much I don't know and am really interested in learning. It's a hobby of constantly learning new things and having lots of fun in the process. But of all the conventions I've been to, I think Anime Expo has to be my fav. It's the convention where everyone appreciate peoples costumes and to showcase your own. Cosplayers who go there are so talented and I am usually amazed at how much work, detail, man hours and money people put into their costumes. Q: It would seem you have to be part costume designer, part hair designer, part make-up designer, and part actor to be a cosplay professional. How much trial and error goes into creating looks? And how often do you seek advice when you've hit a snag? Barry: With cosplay I realized I learned a lot about myself and in the process and it has made me more of a well rounded person. It has taught me how to be more social and polite and not to take myself too seriously. I kinda always knew I was creative, but cosplay opened up new forms of creativity that I didn't know I love - like wigs and make up. I really love doing hair. Currently I have 25 wig heads starring at me, which kinda sounds like a horror movie, especially when I sleep and I wake up in the middle of night with all them starring at me. I also realized I'm good at improv. I work with a lot of kids when in my costumes. Kids love to keep you on your toes, so it's good to be energetic and stay in character. I love seeking advice from friends and people I consider very talented. At the same time, I don't want to steal their secrets on how to make things either. I kinda want them to give me harsh advice in order for me to get better, but overall, cosplay is just trial and error and hopefully in the end it all works out. Q: What is the strangest request you have had while in costume? Q: What is the most embarrassing wardrobe malfunction while out in public? Barry: I haven't actually had that many, oddly enough. I always carry a bag somewhere hidden in my costume that has everything I need just in case of something like that to happen. Q: Do you have a favorite character to dress as when you are not feeling your best? Barry: Hard question. Usually when I'm about to put on a costume that involves a huge wig, caked on make up, prosthetics, heavy, hot costumes and uncomfortable shoes... my body starts shivering, telling my head "please don't do this to me." But, overall, I love being Mario. I grew up with him. He is one of my fav characters and I see a lot of myself in him. 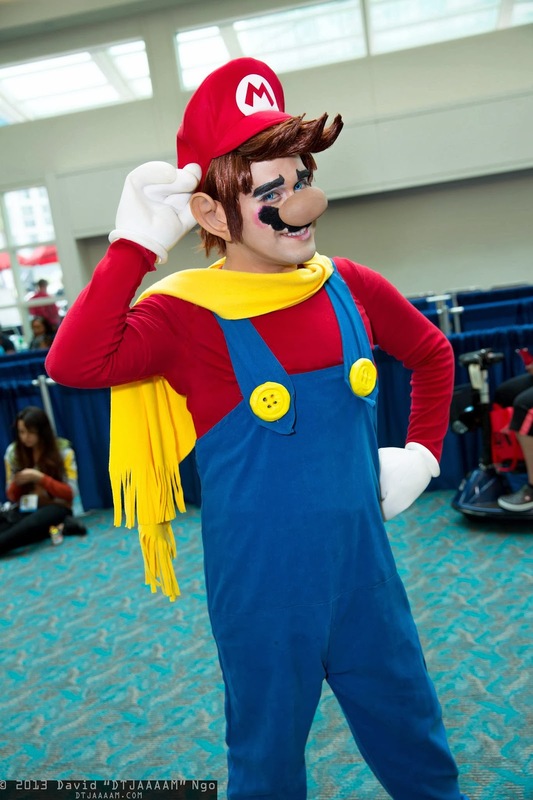 My cosplay pictures of me as Mario are all over the internet, so it is also the character that has gotten me known. Usually people hate me as Mario and they say it all the time in the comments of blogs and other websites. Honestly, I don't blame them. I wanted to do something different than what I had seen before. Some people love it and some people hate it. I can't please everyone. But, really it doesn't matter in my head if anyone hates it because the reaction I have gotten from children coming up to me thinking I am the real Mario has been very gratifying. It is kinda hard to explain but I feel like if you made a child believe that you are the character, then that's all that matters. Q: If you could only be one character for the next year, which would it be? Barry: Well, hands down, Quasimodo. I love the Hunchback of Notre Dame. I related so much to that movie when I was growing up. To the point that when I was little, I made a Halloween costume of him to go trick or treating just to prove a point to my mom. I always felt like the ugly kid, the outcast that was locked in a tower under catholic rule with amazing hair bangs, so that movie helped me a lot growing up. Portraying him would make me really happy. Q: What costumes can we look forward to in the future? Barry: Well, Quasimodo for sure, and Wario. I am still sticking to the franchises that shaped my mind growing up, Disney and Nintendo. -Book Nintentoys for your Event!